eMBMS transforms an LTE network into a single frequency network (SFN) from a device perspective, to enable broadcast or multicast of any type of content to interested users, such as live sports events, live concerts or a news service. Introduced for UMTS with 3GPP Release 6, MBMS was enhanced and optimized for LTE with 3GPP Release 9. Subsequent releases added further improvements that have attracted increased interest from service providers worldwide. FLUTE, MPEG-DASH and advanced video codecs such as HEVC make LTE multicast ready for prime time and can fundamentally change the way content is distributed to large subscriber bases. 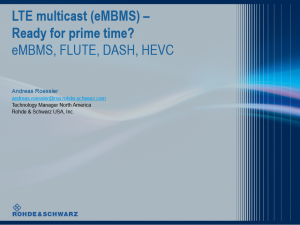 This webinar focusses on the key technical aspects of LTE multicast and how eMBMS/MBSFN are complemented by FLUTE, MPEG-DASH and HEVC. It also demonstrates comprehensive test solutions for mobile devices and how to optimize deployed networks to get them ready for LTE multicast.